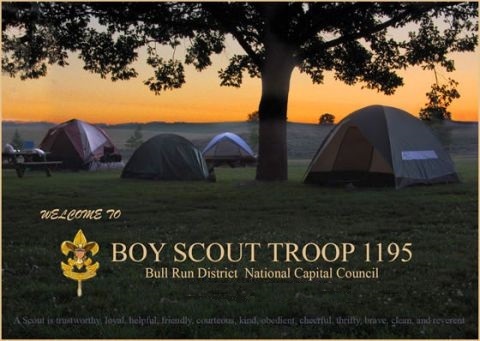 Boy Scout Troop 1195 is a unit of the Bull Run District of the National Capital Area Council of Scouts. We are chartered by the Lake Jackson Volunteer Fire Department and meet at the fire station at 11310 Coles Rd. in Manassas, Virginia. Weekly meetings are held on Monday evenings at 7 PM. We are a boy run troop. To encourage and nurture leadership skills, the adults in the troop supervise, but do not lead the scouts in their advancement in ranks. The scouts are divided into patrols of 6 to 8 boys. For support of new scouts, we have senior Boy Scout and numerous Assistant Scoutmaster's help guide first-year advancements. In addition to weekly troop meetings, the Troop conducts monthly campouts year round and participate in summer camps, both in Council at the Goshen Scout Reservation and out. If you would like more information or if you are interested in visiting or joining the troop, please drop us an email by clicking on "Contact Us" in the Menu section on the left. Please join Troop 1195 as we participate in a multi-district Virginia South Region (NCAC) Spring Camporee at Dominion Raceway in Woodford, Virginia. In addition to challenging Scouts to compete in Soapbox Derby races, this auto-themed Camporee will offer six different merit badge classes on Saturday, April 27, 2019. On Sunday, May 5, 2019, from 1:00 - 3:00 pm, Troop 1195 will conduct swim tests for all Scouts and Adults who will be going on the rafting trip as well as summer camp. The swim test will take place at the Colgan Pool. Please arrive on time, dressed in appropriate swim attire ready for the swim test. Check out the merit badge classes offered by Fairfax County Parks & Recreation this spring. The Prince William Cub Run RECenter also has merit badge classes in April, including during Spring Break. Troop 1195 will be attending summer camp at Rodney Scout Reservation in Maryland from July 14-20, 2019. Please take time before summer camp to read the Rodney Scout Reservation Leader's Guide. Click on the calendar event for additional details. The Venture Crew is once again embarking on a week-long canoeing trip down the James River. The trip will take place July 20-26, 2019, one week after Summer Camp at Rodney Scout Reservation. The cost for the trip will be approximately $250.00. Interested scouts should contact Mr. Malloy by email or at the weekly meeting. Please consider donating your used merit badge books to the Troop Library! Click on the LIBRARY link to see the list of books available. Contact Scott Gladwell at scottgladwell@yahoo.com for additional information.